After an incredible recovery after a car accident, Matt Grice faces his next big hurdle. Three months after a car crash that nearly took his life, Matt Grice continues to improve through physical, occupational and speech therapy. On Friday, he will have a section of on the right side of his skull reattached. It was originally removed in the wake of the accident to alleviate swelling on his brain. 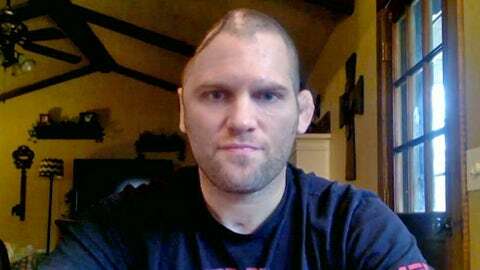 The cranioplasty procedure, doctors hope, will expedite his recovery. As it stands now, his current status is something close to miraculous, doctors and others involved in his care have told him. Grice still has some obstacles to overcome. He has short-term memory loss. He still can’t drive. After a lifetime of 20/20 vision, he has had to wear glasses. His speech is slower than it used to be, although he is perfectly understandable. At times, he says, he feels like he is in a dream, on the outside looking in. But still, he has come so far, and remains so positive about what his future holds. It was on Sept. 8 when another car barreled into Grice as he was stopped at a red light in Pottawatomie County, Okla. Grice was rushed to Oklahoma University Medical Center and immediately underwent brain surgery. The next few days would be harrowing for his family, as Grice was sedated and under constant care. However, he clung to life, and within less than two weeks, was able to respond to verbal cues and to non-verbally communicate with people. But it was when he was removed from sedation and opened his eyes that they knew he would be alright. "My wife said she knew when I woke up, she could see in my eyes that it was me," he said. "She goes, ‘I knew you would push through and come back to us and be OK’. "With all the friends and family and support, I wasn’t going to quit. Of course, that’s never been a part of me. I’ve always been a fighter and that’s part of what made me successful in what we’re going through." He means that literally and figuratively. During high school, Grice was one of the most highly recruited wrestlers in the nation, but shortly after graduating, he was involved in another car wreck. In this one, the impact sent him crashing through the windshield, and his serious injuries required eight surgeries on his head and elbow. With all the friends and family and support, I wasn’t going to quit. Of course, that’s never been a part of me. Still, he went on to recover physically and eventually transitioned to a mixed martial arts career. Grice holds a 15-5 pro record, and was 1-2 in the UFC since returning to the promotion in 2011. However, his most recent fight — against Dennis Bermudez at UFC 157 — was considered one of the best of 2013, and was named the best fight of the first half of the year by many media outlets including FOX Sports. If that’s the last moment he has in the UFC octagon, it will be a proud one to walk out on, but he’s not quite ready to surrender that part of his being just yet. Grice will have to wait to see how his skull fuses. According to medical literature, that usually takes about three to six months. Sometime soon after he’s cleared to do so, he’ll get back in the gym and test out the waters. Nothing is a sure thing. But neither is it an impossibility. At least when it comes to Matt Grice. "It’s been a crazy stretch," he said. "My family and friends have been amazing for me for helping me and for support. All the fans, too. It’s just been amazing. I have two little girls, six years old and three years old. It’s been hard on them. It’s been hard on my wife. So it’s definitely a change. But we all know God has blessed us tremendously that I’m still here. So we’re just thankful for that and focused on getting better."